Getting around can be an expensive business, especially if you're surviving on a pension. Thankfully, there are concessionary transport schemes for the retired that can help with this. If you're aged over sixty, a Senior Railcard entitles you to one-third off the cost of most First Class and Standard rail journeys. You can find application forms at your nearest railway station or a travel agent. Alternatively, you can online on the Senior Railcard website. You'll need to provide some form of identification such as a passport or driving license with your application. They cost £20, but they'll save you a lot more than that! Keep your Senior Railcard with you whenever you make a train journey, and make sure that you use it when you book your tickets, as you won't be able to use them to buy a ticket once you're actually on the train. Senior Railcards cover most of the UK, except for peak journeys in the morning in London and the South East during the week. Some train companies put on special offers that give two for one entry into tourist attractions in London and elsewhere. These entitle the disabled to one-third off rail fares, and this extends to an accompanying person. You can get application forms from railway stations or from a Disabled Person's Railcard Office. In Northern Ireland, disabled rail users can get half-price rail tickets until the age of sixty-five (at which point, rail use is free) through the Concessionary Fare Scheme's 'half fare smart-pass'. Disabled bus passengers are eligible for free fares in their local area in England. For Scotland and Wales, disabled passengers qualify for a free bus pass, along with one accompanying person. In Northern Ireland, the Concessionary Fare Scheme's 'half price smart-pass' entitled disabled passengers to half-price bus fares until they are sixty-five (then it's free). Most bus companies are offer free bus travel, or at least reduced fares for those who are sixty or over. Check with your local bus company to see what their policy on this involves. In London, the disabled and those over the age of sixty can get a Freedom pass, which entitles you to free fares on much of London's transport system. National Express coaches offer half-price travel on coach journeys for passengers who are sixty or over. This doesn't apply to travel on Fridays at any point in the year (and Saturdays are excluded in July and August). Those days are subject to reductions of up to 30%. It's best to book in advance to make sure that you get the correct discount, as buying a ticket on the day that you intend to travel will only result in a 30% reduction. Concessionary fares are available for disabled passengers, but this isn't always the case, so do check in advance before you arrive. If you have a guide dog, hearing dog or assistance dogs, taxi fares are free of charge. 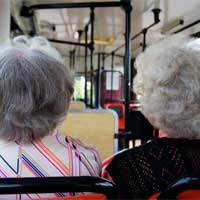 You can get reduced fares on some journeys if you're aged over sixty. This is especially true in Scotland. Reduced fares are available for those who sixty on some flights (this is over sixty-five in some cases). This mostly applies to flights outside of the UK. For concrete details, ask your travel agent about senior reductions.